Oh the bounty of a summer garden! Yummy fresh tomatoes are bursting off the vine this time of year. Don’t have garden? Ramble through the local farmers market and snap up some delicious cherry tomatoes. They are fresh, sweet, and oh so versatile! Not sure what to do? Well keep reading. Friends just came by and an impromptu summer patio party is underway. Need a quick appetizer? Take those cherry tomatoes, put a small dish of vodka spiked with horseradish beside them, and place a shaker of celery salt there too. Get the toothpicks and Voila! A fun light Bloody Mary appetizer is ready in an instant. Put a cherry tomato on the toothpick, dip it into the vodka, shake a little celery salt on it, and pop it into your mouth. The bite begins with a delicious pop of tomato, then the other flavors flow over your tongue. Yummers! Want something a little more succulent? Put some olive oil into a pan and heat it up. Add the tomatoes to the hot pan and give it a shake of salt, pepper, and stir. Let those cook for a bit, and they will begin to get creamy! Be patient and let those cook a bit longer, stirring every so often. Now you can add a clove of garlic that is diced. You will be rewarded-but what is next? Is this a base on which to jump off, or is this IT? If this is IT, scoop in on a lovely piece of chicken and enjoy. Want to go a different direction with this? Okay-lets go! You can add this to sautéed summer squash. Or you can toss it on some squash that has been through the vegetable twirler and enjoy a light vegetarian main “pasta” dish. Play with herbs a bit before adding to pasta, perhaps adding some fresh summer basil and parsley. Red pepper flakes would also be a well paired addition. Ready for another option? Start with colored tomatoes and cook the same way. After these beauties get good and velvety, add some spinach, arugula, or fresh green of your choice. Let that cook together. Oooohhhh! We are on the train to delicious town! Add some chicken or vegetable stock, stir, and add some pasta. Summer fruits are bursting with flavors and colors. This season gives us sweet treats with fresh aromatic melon, berries bursting with sweet juice, and gorgeous succulent ripe peaches. 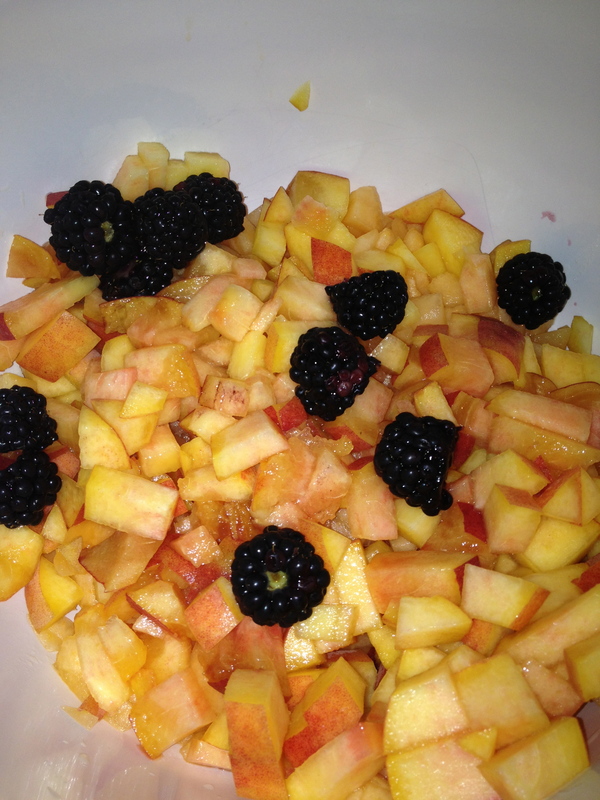 But we are rounding the corner to the summers end and need a new way to enjoy summer fruit. How about a yummy salsa? This fruit salsa is delicious with meat and seafood. Or try serving it along side a grilled pork tenderloin for a nice pop of flavor and color. Spoon it onto flavorful chicken thighs. Oh…you want it for an appetizer? You can do that too. This salsa is just as great with crisp yellow corn chips. Or maybe try it alongside some brie cheese and crackers. The possibilities are endless! As you will see there is so much flexibility with one simple recipe. It has bold flavor and is packed with nutrients. It is a snap to make and easily customizable to suit your own personal preferences. I make this fruit salsa with cilantro for a little kick, but I would use basil in place of cilantro it if my mom was going to eat it. She doesn’t like cilantro. That is the beauty of a recipe like this. It is packed with flavor, has good nutrients, and is very colso easy to alter to please your crowd! Here it is. But remember…I consider recipes a “jumping off point” if you will. Recipes that I develop, like this one, can be changed to suit changing taste, available ingredients, or budgets as often as your like! Mix everything except the lime together. Stir. Squeeze the fresh lime over the top and drizzle with olive oil. Give the salsa another good stir and there you have it. This is best if it sits for a few hours in the fridge before serving. Go for it! 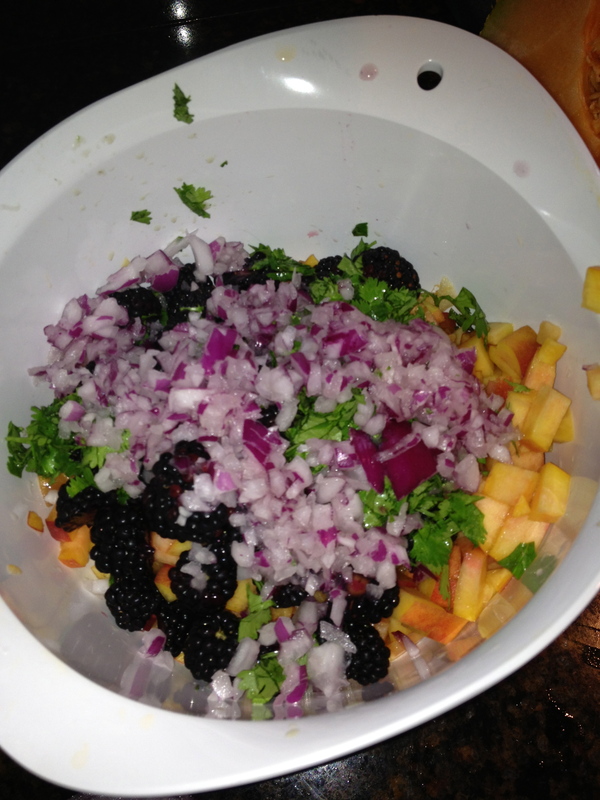 Grab up some fresh summer fruits and make a delicious salsa of your own! The warm weather is coming. Thank goodness. I am tired of the gray rainy spring. As much as I detest the horror of getting my jiggles and wiggles into a swim suit, I simply adore summer. The breezy warm nights, a casual vibe, outdoor evening concerts, dining al fresco. Yes, the pleasures of summer are many. But take caution. The warm weather can increase the threat of dehydration. If you are thirsty, you are already experiencing mild dehydration. And did you know that dehydration is the number one cause of daytime fatigue? Even mild dehydration can decrease endurance, slow cognitive thinking, and cause headaches. Great reasons to stay hydrated. Interestingly enough, studies suggest that 70-80% of daily hydration should come from fluids, and 20-30% from the water content in food. So, it is important to drink water and healthy fluids during the day and limit sugary drinks. But in addition to that, especially in the warm summer weather, it’s also important to eat foods that are high in water content. Need a list? Look no further. This list contains fruits and vegetables with more than 90% water. Looking at this list I hope you are not thinking of just eating these wonderful fruits and vegetables solo. Oh no! Lets have some fun while we eat our water! How? So glad you asked. How ’bout this…a salad. No, not a lettuce side salad. A cucumber watermelon salad is the best! So hydrating and refreshing in the hot summer months, not to mention beautiful. Simply dice up watermelon and cucumber. Toss. Then the fun begins. Make it more sophisticated with mint. Or add a savory balsamic glaze. There are a million ways to customize this fun summer salad, and it will keep you alert and ready to go to the next thing. So this summer, don’t forget to eat your water! 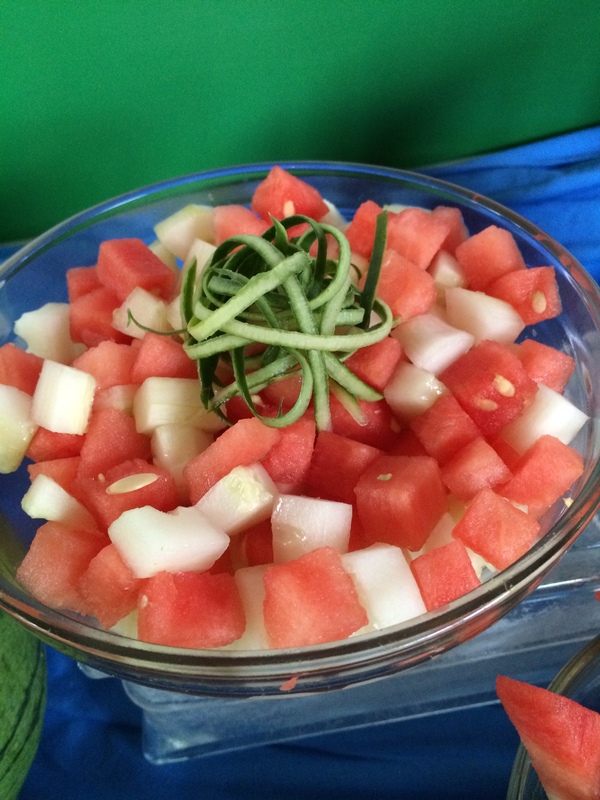 Watermelon Cucumber Salad. Delicious and refreshing. Oh..and so pretty!